Cinnamon is a spice obtained from the inner bark of several trees from the genus Cinnamomum that is used in both sweet and savoury foods. While Cinnamomum verum is sometimes considered to be "true cinnamon", most cinnamon in international commerce is derived from related species, which are also referred to as "cassia" to distinguish them from "true cinnamon". Besides use as flavourant and spice in foods, cinnamon-flavoured tea, also flavoured with cardamom, is consumed as a hot beverage in Bangladesh, India and Pakistan. Cinnamon bark is widely used as a spice. It is principally employed in cookery as a condiment and flavouring material. It is used in the preparation of chocolate, especially in Mexico, which is the main importer of cinnamon. It is also used in many dessert recipes, such as apple pie, doughnuts, and cinnamon buns as well as spicy candies, coffee, tea, hot cocoa, and liqueurs. True cinnamon, rather than cassia, is more suitable for use in sweet dishes. In the Middle East, cinnamon is often used in savoury dishes of chicken and lamb. In the United States, cinnamon and sugar are often used to flavour cereals, bread-based dishes, such as toast, and fruits, especially apples; a cinnamon-sugar mixture is even sold separately for such purposes. It is also used in Turkish cuisine for both sweet and savoury dishes. Cinnamon can also be used in pickling. Cinnamon bark is one of the few spices that can be consumed directly. Cinnamon powder has long been an important spice in Persian cuisine, used in a variety of thick soups, drinks, and sweets. It is often mixed with rosewater or other spices to make a cinnamon-based curry powder for stews or just sprinkled on sweet treats. It is also used in sambar powder or BisiBelebath powder in Karnataka, which gives it a rich aroma and unique taste. Cinnamon has been proposed for use as an insect repellent, although it remains untested. Cinnamon leaf oil has been found to be very effective in killing mosquito larvae. Of the compounds found in the essential oil from cinnamon leaves, cinnamyl acetate, eugenol, and anethole, and in particular cinnamaldehyde, were found to have the highest effectiveness against mosquito larvae. 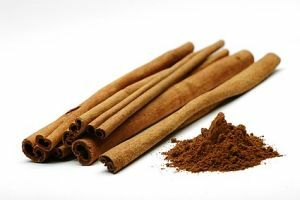 Cinnamon, as a warm and dry substance, was believed by doctors in ancient times to cure snakebites, freckles, the common cold, and kidney troubles, among other ailments. However, newer studies showed that some substances in cinnamon, particularly coumarin, may cause liver damage in some sensitive people. Along with garlic, cinnamon is used as a fish and meat preservative and in the future might be used in an inner layer of plastic as it has antimicrobial properties up to 120 °C (250 °F); cinnamon and garlic can also be used to preserve fried and deep fried foods. Recipes using Cinnamon see Here, Here and Here. Great in coffee, hot tea, hot chocolate, & warm milk. one of my favorite spices.